Compatible with the Belly Band modular holster and modular mag carriers only. The redesigned CrossBreed® Holsters Belly Band incorporates an additional length of elastic band that extends over the CrossBreed® Modular Holster. This provides additional support for the holster and firearm. The additional length of band firmly secures smaller firearms while offering the necessary support for wider and heavier firearms. In addition to improved support, the CrossBreed® Holsters Belly Band now incorporates a sewn magazine or flashlight pouch and a horizontal Hook & Loop enclosed accessory pouch for carrying a cell phone, wallet, or similar items. An optional Modular Magazine Carrier is available to add to the band. The Modular Belly Band is available in four different sizes: Small fits 28"-34" waists, Medium fits 34"-42" waists, Large fits 42"-52" waists and Xtra Large fits 46"-66" waists. 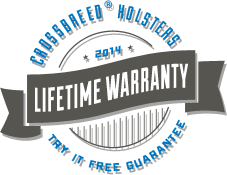 The Belly Band (Band Only) does not come with the CrossBreed® Lifetime Warranty. Product Size: 53" x 0.05" x 4"